(Newser) – All kinds of theories have been floated to explain the mysterious noise blamed for ailments akin to brain trauma at the American embassy in Cuba. Now two scientists have put forth the simplest theory of all: crickets. More specifically, the scientists say they believe a certain cricket—the Indies short-tailed cricket—is responsible for the noise heard in this AP recording that emerged last year, reports the Guardian. "There’s plenty of debate in the medical community over what, if any, physical damage there is to these individuals," Alexander Stubbs of the University of California, Berkeley, tells the New York Times. "I can say fairly definitively is that the AP-released recording is of a cricket, and we think we know what species it is." The researchers, however, say their study doesn't rule out the possibility that victims suffered some other kind of attack. I think someone was piping in some Beyonce. 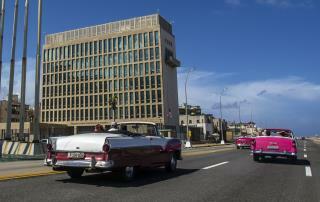 The Cubans have no reason to attack the US Embassy ... if they didn't want them there they could just make them leave. Its natural or another party. Or maybe it was Soca music...? just as good a theory as crickets.